One: Get a back up career. If you want to tell your own stories in your own way then it's a hard life. So you probably need to do something else. That something else should be film related, but another source of cash. John has been a film critic for example. Two: If you can't be expensive then be controversial. John frequently used his bad reviews on his publicity material and told an anecdote of when not only he got arrested but also his entire audience! Three:Find your own way. He still struggles to get funding. And his way may not be your way, just as his stories are probably not our stories. You need to find your own unique way to get funding. Obviously thinking about our own special way of funding and marketing Circumference I asked him a question about how important it is for film makers to be creative with their marketing as well as their story. 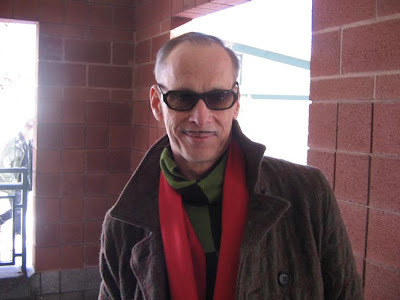 We think of these ideas as new, but of course John Waters has been doing this for years. He was one of the first to 'four wall' his films - that is to dry hire a theatre and then screen his own film and keep the ticket price. He has had actors dressed up handing out flyers. He's got into the neighborhoods and put up cheap posters. All these are good ideas. And I guess the internet can be the new playground for this kind of thinking. Its just a bigger neighborhood. All this talk of Russ Meyer AND John Waters all in the same blog, with people meeting the legends too.